HMH Books for Young Readers, 9780618311125, 40pp. Have you ever seen an orchestra perform? What are all those different instruments and how do they all play just the right note at just the right time? 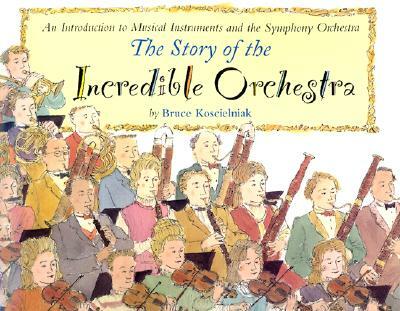 In this fact-filled and entertaining picture book, Bruce Koscielniak gives us a lively look at the history of the orchestra and all the instruments that make up this wonderful gathering of sound. From the "tooter, strings and beaters" of the 1600s to the keyboard synthesizers of today, this playful exploration follows the developments and trends of music and instruments over the past four hundred years. Bruce Koscielniak is the author and illustrator of several books for children; he is also a musician who has played the violin and jazz guitar for many years. He lives in the Berkshires region of Massachusetts.